← The Island this Season Will Be All About Gold…On Everything!! MILAN–Bugatti Automobiles SAS, the maker of cars that are as extreme in speed as they are in price, is taking a turn into the fashion world. The unit of German car giant Volkswagen AG is launching a collection of men’s clothing and accessories and opening a network of stores around the world to sell them. Offering everything from shirts to suits and watches to handbags whose designs are inspired by the aerodynamic bodies of its cars, Bugatti wants to raise the awareness of its brand—even among those who can only dream of owning one of its models, like the Veyron, which costs more than €1 million apiece. Celebrating the launch Thursday in Milan where fashion week is in full swing, Bugatti showed off its Lifeline Collection at one of the city’s best-known art museums: the Accademia di Belle Arti di Brera. “It’s not merchandising,” said Massimiliano Ferrari, managing director in charge of the brand, explaining how Bugatti oversaw the development of the collection with its Italian tailors and artisans, whose identity he declined to disclose. Showing off one of the suits on display in an exhibition room next to the museum’s courtyard, Bugatti Art Director Daniele Andretta said he made sure even the smallest details reflected something of the car. One side of the collar of a suit jacket, for example, was blue—the color most associated with the brand. On another clothing rack, Mr. Andretta showed how part of the inside lining of a jacket was shaped like the front grill of the car. The shape of front pockets on other jackets or the stitching lines on a shirt copied other small features of the car. 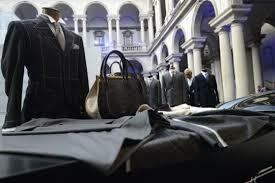 The textile used for the suits comes from Loro Piana, an Italian fixture in the clothing world. There are also monograms and silver brooches made into the dancing elephant symbol of the brand. As for watches and other accessories, Bugatti is going into partnership with Swiss watchmaker Parmigiani and others. There’s one piece for women: a blue, crocodile skin bag shaped like the front grill, which resembles a silhouette of a horseshoe. To maintain a sense of exclusivity, Bugatti is only having 431 units of every article made. Once they have all sold out, Bugatti will start on the next collection. The number commemorates the land speed record time achieved by the Bugatti Veyron Super Sport in 2010, making it the fastest production sports car in the world. For the privileged owners of its cars, Bugatti is offering something to bring them even closer to these jewels of the road: a customized service that can design clothing, bags and other accessories sporting the colors and design features of their cars. 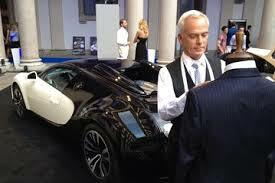 Bugatti will open a showroom in Milan in October before embarking on the creation of its global retail network. 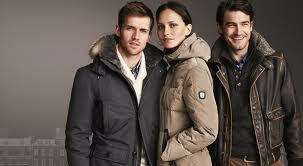 The first of the network’s planned 35 stores will open in Hong Kong and Shanghai in 2014. As for the key chains, model cars, leather bags, umbrellas and deodorants that can be bought on its website, Bugatti is revamping the selection to make it more exclusive as well, Mr. Ferrari said. Sweet information, man. Can’t wait for your next one. Cheers for the fabulous post. Genuinely captivating. Fine remark. Couldn’t agree with you more. one up related to autos, yet you should not know the way to get on the ball. for over a decade Marty’s ordinary column developed within your professional photographer newspaper. and additionally his or her drafting breaks, Marty makes earned quite a few digital photography training cash incentives, supplies lectured here in 48 promises, is now journeyed around the globe as lecturer, and after that tell. in order to really participate in the first cultural swap in indonesia in 1986.